Applies to UK Mainland deliveries with Next Working Day delivery selected, excludes bank holidays. 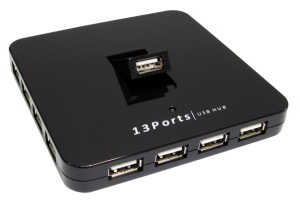 The USB2-3013HUB is a USB 2.0 13 port hub that is quick and easy to install with driverless installation by taking advantage of Windows and MAC built in USB drivers. 12 horizontally mounted and 1 foldable vertical 480Mbps ports. Works seamlessly with your USB1.1 and USB2.0 devices. Slim design, saves desk space. Supports hot swapping of all your USB devices. Supports data transfer rate at 1.5/12/480Mbps. 1 Free USB 2.0 Port. MAC OS 8.6 and above. Windows 98SE, 2000, ME, XP, Vista, Win7. D25 to 36 Centronics Parallel Printer Cable 3m IEEE 1284 parallel Printer Cable Length 3 meters D25 Male to 36 Centronic Male Moulded Grey PVC IEE 1284-1994 Compliant Ideal for connecting a PC with a 25 pin parallel port to printer with a centronics 36 way connector. The Micro KVM CPU with attached cables allows users to access two computers from one keyboard, mouse, monitor, and also allows one set of 2.1 speakers to be shared between two computers. Two cables (1x 1.8Mtr 6ft and 1x 0.6Mtr 2ft) are supplied moulded to the switch with a uniquely styled strain relief that can be used to attach the Micro KVM Switch to a desktop or wall to protect the Micro KVM from damage or dirt.No interface card or software is needed, Installation is as easy as connecting cables from the CPU Switch to your computers. Operation is as simple as entering hot-key commands from a keyboard.The Micro KVM Switch is independent of computer operating systems. The USB2-33COMBO is a 5.25” bay that can be converted into a 3.5” bay and a PCI card. The 5.25” / 3.5” bay houses two USB 2.0, one 4-pin and one 6-pin firewire ports for the front of the PC. The PCI card from the USB2-33COMBO has two USB 2.0 ports and one 6-pin firewire for the back of the PC.